Found via Zeh, this great bulk loading kit for AS3 from Arthur Debert. AS3 Loaders are very useful, but when you have large projects there is always a pause and focus on loading scenarios and architecture needed for your loading scenarios, sometimes this can literally eat days and entirely change performance with wrong moves. BulkLoader is a well written kit from Authur Debert that makes loading scenarios or using BulkLoader as a base to your loading situations a great pluggable piece of code that has many excellent features. Some of the calls like BulkLoader.getLoader(“main-site”).getContent(“bg”), are also very similar to Silverlight’s downloader object that can be queued like this. All in all a kit that is very useful that I have already put to work and will help teams standardize on bulk loading for those killer flash apps. Other convenience functions: getXML, getText, getNetStream, getSound, getMovieClip, getNetStreamMetaData. You can retrieve an item using it’s id, it’s url as a String or as the URLRequest object (if the item was created with an URLRequest). BulkLoader is a minimal library written in Actionscript 3 (AS3) that aims to make loading and managing complex loading requirements easier and faster. BulkLoader takes a more dynamic, less architecture heavy aproach. Few imports and making heavy use of AS3′s dynamic capabilities, BulkLoader has a one-liner feel that doesn’t get your way. BulkLoader tries to hide the complexity of loading many data types in AS3, providing a unified interface for loading, accessing and events notification for different types of content. 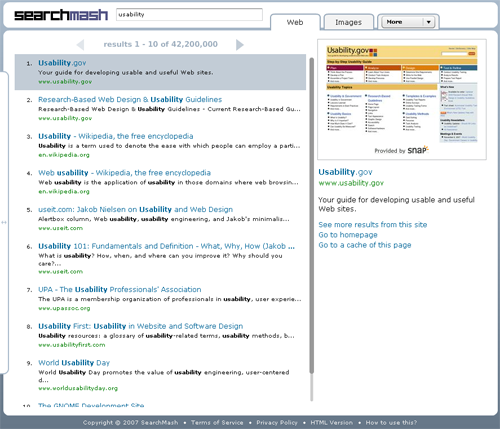 This library is licensed under an open source MIT license. 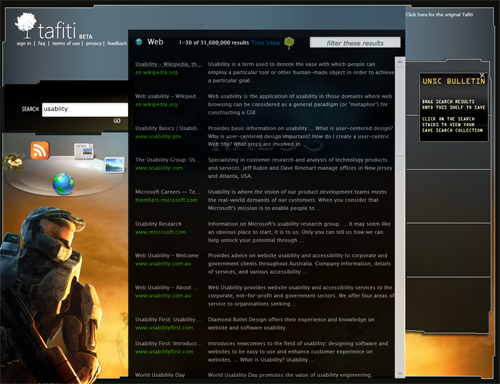 Unified interface for different loading types. Events for individual items and as groups. Stop and resuming individually as well as in bulk. Statistics about loading (latency, speed, average speed). Multiple kinds on progress indication: ratio (items loaded / items to load), bytes , and weighted percentage. Dynamic nature: items can be added by specifying a url as a String or a URLRequest . Items can be assigned an identifier key to be used on retrieval. Only one class to learn / use. Few connections to open: bytes total can be used instantly. Many connections opened for data of widely varying sizes: progress by weight. Check out and download AS3 BulkLoader! This is quite a contribution to the flash community and is a perfect candidate for the base of your loading assets projects and scenarios. Thanks Arthur! 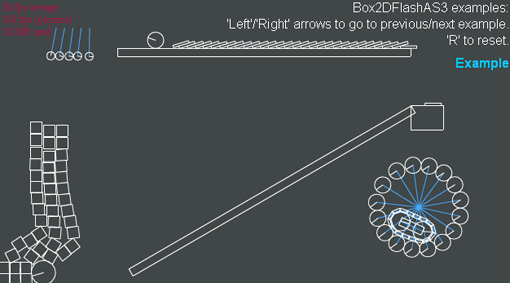 Andy Zupko is probably doing some of the coolest / useful work in performance and possible effects combining 2D and 3D. Using 2D BitmapData and papervision 3D it turns out you can create a parallel dimension of coolness that cannot fully exist by themselves. Papervision 2.0 with these effects and if it is as pluggable as it seems is very good for games that lighting is a key component or effects. Imagine a game that can customize weapons with 2d effects in 3d, or rocket boosters, or fireworks or all kinds of inspiring things like changing the mood or environment such as fog, lighting etc… If you start taling about adding physics to all this it just gets too fun. Effects have always been there and around, but making this possible to have a semi-standard way to do this and if it is pluggable, this can lead to many engine advancements. I think the PV3d team additions of Tim Knip and Andy Zupko have been very good and zupko era in PV3d has begun. Tim Knip is also very active and helping to really organize the ascollada formats and performance stuff like only drawing what is on screen. Who needs Hydra now? j/k although having this now in papervision leads me to see a very fun 2008 ahead for Flash, it is also, if as pluggable as it seems, a bit like a shaders kit. 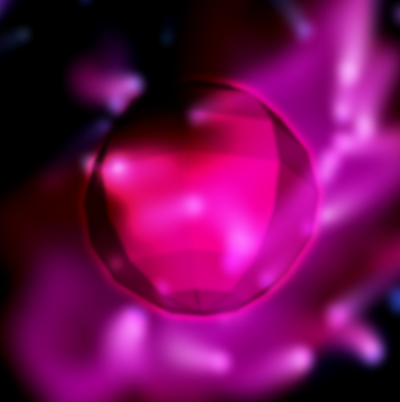 All those older great 2d effects merging into 3d from the good old days (some still going very strong) of praystation, yugop, levitated, neave (great 2d tv effects in neave.tv) , flight404 (moved to processing) and many others. And a new era of zupko [pv3d], mr. doob, unitzeroone [pv3d], fabrice [away3d] and many more a new 2d effects in 3d platform is emerging. This kit for papervision3d by zupko and Hydra is making the future glowing full of bright points, and lots of effect explosions. 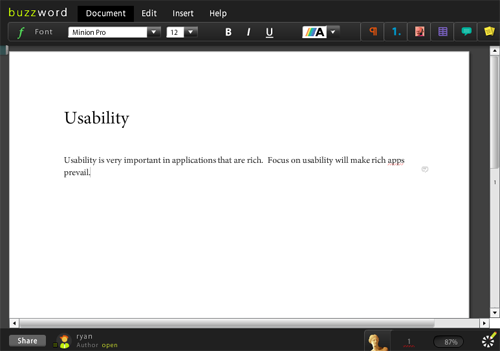 Let’s hope papervision3d 2.0 it is released soon and it has zupko’s effects code in there. 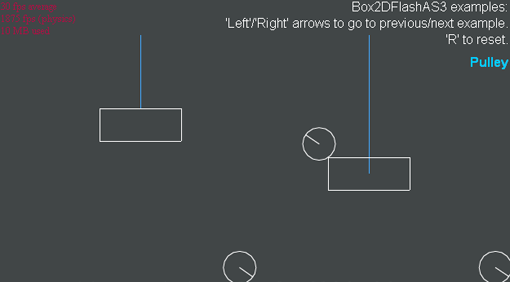 Another great new 2D physics engine for AS3 has been released called Box2dFlashAS3 that is based on the excellent kit Box2D for C++. It has been a busy year for physics engines in AS3. FOAM was released this month, APE, the highly anticipated Motor Physics from polygonal labs and plenty more still I am sure. 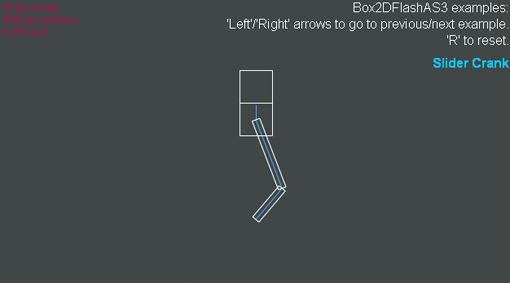 The Box2dFlashAS3 version has some great demos available on the site that show, use the arrow keys to move to the different demos highlighted here. 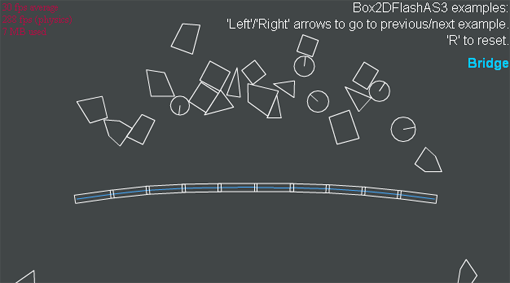 Box2DFlashAS3 is an open source port of Erin Catto’s powerful c++ physics library Box2D. Cycle through the demos to see some of the features. Full source code for the engine and examples can be downloaded from the project’s sourceforge page found Here. This kit is nice because it mimics Box2D for the crossover and ability of developers to use it in C++ and Flash AS3 moreso than other kits. It looks good and performs well except for a memory or FPS pause I get intermittently. 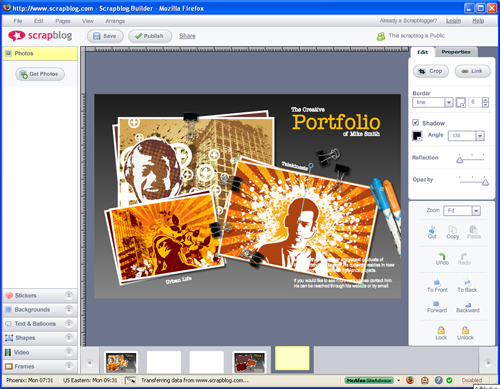 The demos are already inspiring many uses of the features highlighted for games and effects. Moses, the maker of FuseKit, is hoping to influence Adobe product lines to include a common base for animation and motion going forward. Currently the AS3 world is very alive and is inspiring developers like myself to build lots of toolkits and really creating reusable code and kits that can make things very easy from going to Flash to Flex. 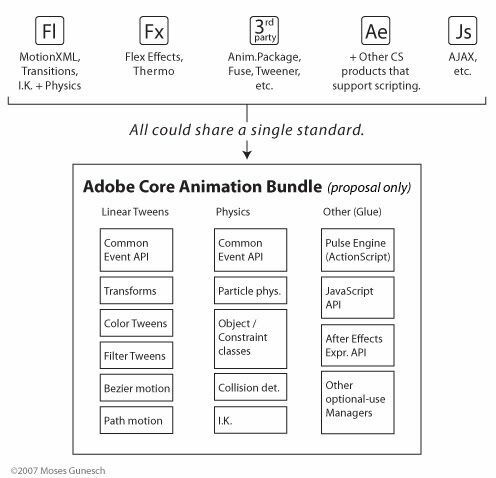 But wouldn’t it be nice if a part of these kits that have to be downloaded every time you have an application use them be part of the native Adobe applications, or a core animation kit that partially standardizes animation basics to build upon further? Start standardizing some of the basic tools of building motion and filter kits to native but still allowing a flourishing open source and community research and development aspect. “It was also a pleasure to see Richard Galvan present the upcoming crop of Flash features: the sleek update to the animation timeline (better late than never? ), support for columnated flowing text (double finally!) 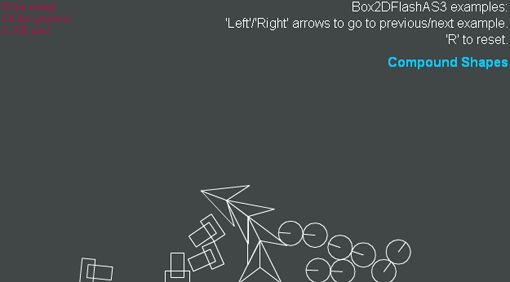 and the big one, native 3D player support for Display Objects as rotatable 2D planes. He ran out of time and didn’t get to a few others shown at Adobe MAX, such as built-in IK (inverse kinematics) and faster pixel-level drawing for texture-mapping and photoshop-like filter effects. I don’t use After Effects as much right now but if I could easily incorporate this into Flash/Flex and script and animate in a similar syntax and way I know After Effects would definitely have a boost in interest. The reality is right now the only problem with kits like Tweener, TweenLite, Tween, mx.transitions, mx.motion, etc is that the source has to be embedded in movieclips multiple times. Sometimes there are multiple animation kits per compiled SWF that have to be used for more advanced features. This adds bulk that if common might not need to be there (this comes into play still on mobile and large games/apps). Let’s say you have an application that pulls in many disconnected SWFs and they all have animation in them, well if you have 20 of these let’s say, and you embedded a very small Tweener at 9k per SWF. That is about 200k of duplication of AS code. Due to the kits small sizes this is not a problem really but when animation kits like Animation Package come into play, you are talking 40k per SWF which would leave you with almost a meg of just duplicated animation code. I don’t think this is that major of a problem for kits like Tweener (9k compiled) and Tweenlite (3k compiled) but as projects get bigger and more depth of animation platforms needed this can be a problem. This can also be solved in architecture with a controller and dummy SWFs to animate but there are times when you need animation in the compiled SWFs and then also need it in many others and the controller. The other reality is the animation kits (mx.transitions.easing, mx.transitions.tween) for Flex and Tween for fl are a little bloated, more difficult than needed to use and as has been seen, much slower than kits currently available in the community. My one fear about this is that if Adobe makes this, possibly like Microsoft’s toolkits and libraries they put out, they are always bloated and slower, then because they are embedded they are untouchable. If it was standard enough as building blocks that are faster because they are native, then this is the best option as embedded script would be hard pressed to beat native code in the players/applications. Some of this is underway…. 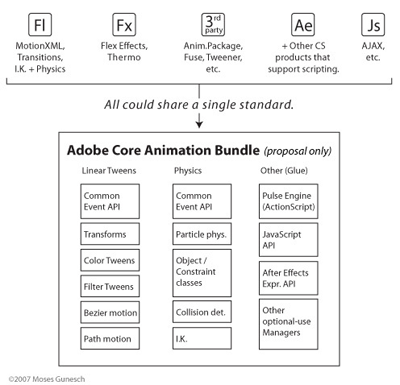 Animation kits for future, Adobe is releasing Flash 10 called ‘Astro’ that has many new improvements in tweening with xml closer to flex or even Silverlight like transitions and storyboards. Aral Balkan, a sponsor of OSFlash, posted on this and even that Diesel Flash CS4 will include more Tween tools for IK/bones. Tweener , TweenLite, Animation Package, Animation System etc these are all helping to define the best way to do animation kits. 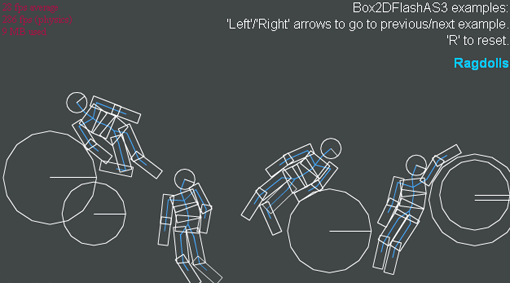 Physics toolkits have their own animation kits currently usually to handle the movement according to algorithms. FOAM, APE , Box2DFlashAS3 (just released very recently will be posting more on this after I check it) and Motor Physics (unreleased but heavily demoed at polygonal labs) are great physics toolkits and I like this being part of the community to get refined, maybe one of them or the best performing ones becomes part of the proposed Adobe Animation bundle. These will define the best way to do physics kits. 3d in flash toolkits have also been emerging rapidly in 2007 with Papervision3D, Away3d based on pv3d, Sandy, and even engines starting to get built on top of these platforms. 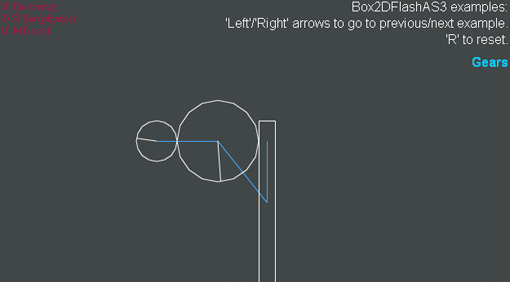 The general direction is moving towards another platform in there somewhere but I think much work is left to be done to standardized physics systems, 3d and advanced motion filter tweens and bezier, splines (Catmull-Rom), editors, etc. 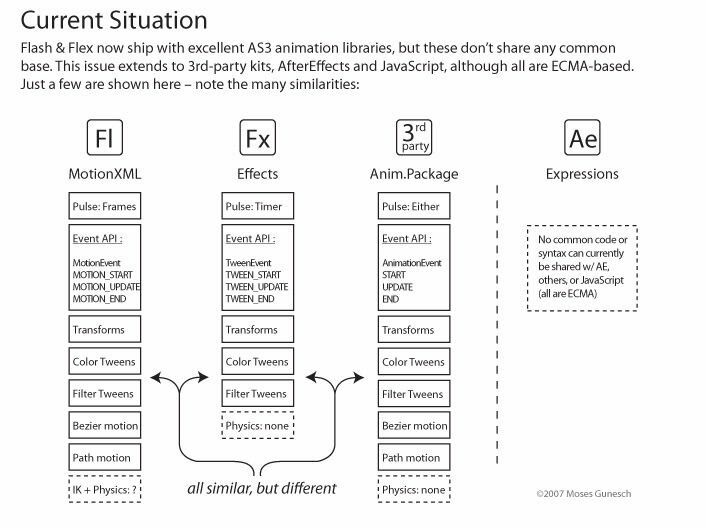 I think it is getting time for basic animation kits to become more standard though and in latest versions of flash this is included in the flex and flash scripts but not the native code. There is also Hydra and the AIF Toolkit that are standardizing After Effects and Flash shaders and filters into a new shader language like Cg and reminiscent of processing.org. Sandy 3.0 was released today. To go along with that a RedSandy (Red5 and sandy demo) has also been released. Sandy is the original 3d flash engine that was around before Papervision3D and Away3D and all the others. 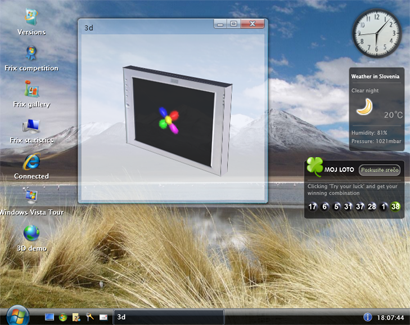 Sandy3d is an excellent library and it has many features that others do not have well particularly in the easier control of objects and importing all types of files such as ASE, WRL and 3ds in addition to COLLADA which other 3d engines like PV3d and Away3d support although it has been slower in the past 3.0 may change that. Flash player 7 to 9 compatibility. 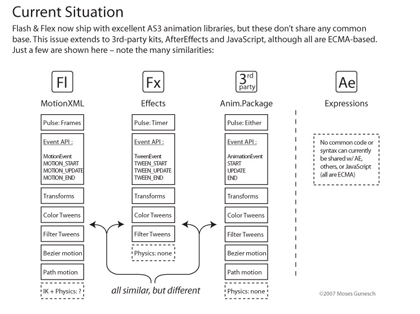 Both MTASC and Macromedia compilers compliant for AS2 and Flash CS3 and FlexBuilder for AS3 versions. 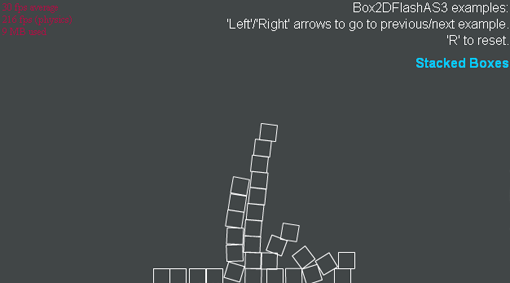 Several 3D primitives, allowing fast and parameterized object creation without any 3D modelisation knowledge. Material system to easily change your objects appearance. Several material are available allowing to create transparent faces, bitmap texture and video texture as webcam video stream. Red5 is the best multi-user media server out there right now and it is built with Java. The cool and probably most interesting part is Sandy combined with Red5 to create multi-user environments in 3d for flash. There have been experiments with this and many attempts at this and is being done but an open source kit that does this is very helpful and these are two great flash toolkits in Sandy and Red5. Drew Cummin’s FOAM is a great flash as3 2d physics package that can be integrated quickly and get started with realistic physics in 2d flash apps and games. I have been playing with this since FOAM’s release last week and putting together some tests to show, comparing with APE and really looking forward to polygonal labs Motor Physics to add there. If you are developing realistic physics in flash games or apps this toolkit is a great source of inspiration. A new AS3 physics engine has been released from generalrelativity and adds itself to the block. It is in early alpha but this is looking pretty good so far. APE, the highly anticipated Motor Physics from polygonal labs and now FOAM, so many wonderful physics toys to build games with!